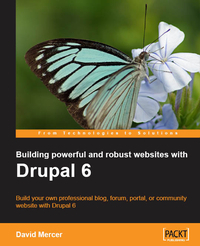 Packt Publishing is continually coming out with Drupal books for different verticals. They have a "Drupal for Education and E-Learning" title coming up, they sell the "Drupal Multimedia" title, and they are spot on with "Selling online with Drupal e-Commerce". Their target is the beginner who might have chosen another e-commerce software, and would only choose Drupal if directed from start to end to build user registrations, static pages and the e-commerce functionality itself. 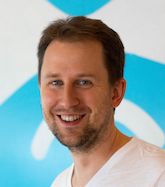 Interestingly the original announcement of the book on Drupal.org spurred a lot of "why a book about a dead module, write about Ubercart instead". But this book is a testament that Drupal is really open, and the two competing (huge) module sets for e-commerce: Ubercart and e-Commerce are both moving along and worth evaluating. Coincidentally I got this book for review just I was about to build the registration cart/wizard/payment interface for Drupalcon Szeged. We were in talks with Ryan Szrama from Ubercart who was about to sign up to help out with our payment system, I've been reading the book on the competing module suite, and at the end decided to assemble a custom built Signup, Signup Status and Simple Paypal modules based solution. I would not suggest you to go on a custom module set route unless you see your requirements really clearly, and feel adventurous enough to build an exceptionally tailored system for your own needs. (In our case, it turned out that our model was not as fitting to practice as we thought so, and an Ubercart / e-Commerce based system might have been a better fit). Generally, I'd suggest you to just grab a cookbook like this one and play along. Because this book starts from the beginning and builds up a shop from the ground up, it will be useful to you even if you are not going to use e-commerce, but instead would take Ubercart. Some concepts will be a bit different, but you'll get an understanding of the issues involved with building a shop, including permissions, roles, branding, tax rules, payment and shipping details, securing sites and marketing the business. 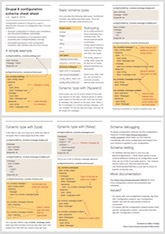 There is a lot of value in this book for beginner Drupal site builders beyond dealing with the e-commerce module itself. 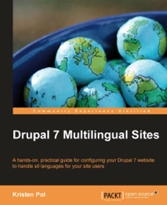 Basic concepts such as Drupal content and user management are explained, so that you can just take this book without buying a few hundred more pages on generic Drupal site building. On the other hand, appropriate contributed modules like Taxonomy Access Control, Image, Image Attach, CAPTCHA, Legal, Login Security, etc. are used and explained briefly where necessary. Of course this also means that if you need specific information on things such as Drupal theming, you'll need to refer to other resources, but that's not a pre-requisite to building a shop, right? 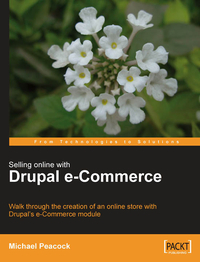 All-in-all, I'd suggest you to read this book, if you are a Drupal beginner looking to set up shop on the internet, or a somewhat experienced Drupal user, who never built a complex e-commerce site yet.